This log goes back in time, with newest entries at the top.Scroll down for links to news articles and inside gossip.We cover the Save the Delta Queen Campaign, general steamboat news and history, steamboatancestry, paddlewheel boats wanted / for sale,and guestbook postings. Anothersite to buy and sell paddlewheel boats: eBay.More Save the Delta Queen Campaign web sites:steamboats.org *save-the-delta-queen.org *DQ bumper stickers, pinsTo search this section or the whole site, go to Steamboat News Archive.If you want to post to this page, click here. CHATTANOOGA, Tennessee (December 3, 2009) - As the holidays approach, the legendary Delta Queen twinkles with lights and good cheer as she hosts guests from all over the world in her new role as a dockside hotel on the Tennessee River at Chattanooga's Coolidge Park. With the help of her many devoted volunteers, the 1927 Steamboat has been meticulously cared for since her arrival last February, an undertaking that has proven gratifying for those who love her most. Sydney Slome, proprietor of the Delta Queen Hotel, has announced the Delta Queen Crew Club, a program that recognizes the beloved boat's most loyal fans by offering an opportunity to commemorate their trips with the purchase of a brass-plated nameplate. Each plaque will be engraved with the name of the passenger, their home "port," and the number of cruises they have taken on the Delta Queen. The plaques will be adhered to each of the vessel's three decks beginning at the tip of the bow, below the hand rails, at ankle level. Slome assures that the process will not compromise the boat's historic integrity in any way. "We are committed to maintaining the Delta Queen to a level of standard that she deserves and demands," says hotelier Sydney Slome, "This program will contribute towards her care and maintenance while providing a special way to remember the joy she has brought to so many during her years of service." Harry Phillips coordinated the relocation of the historic vessel from New Orleans to Chattanooga last February. "Captains, mates, engineers, and loyal passengers continue to donate their time to clean, paint, polish, and serve as greeters and tour guides while visiting the Delta Queen as a boutique hotel," says Phillips. "It has been an honor to work in their presence." Former staff and loyal past passengers continue to gather aboard the Delta Queen for work weekends in Chattanooga since the boat's arrival. Pat Traynor of Marco Island, Florida, has taken 45 trips on the legendary Delta Queen since 2001, and has visited the Delta Queen Hotel five times since it opened in June. "The old gal still exudes her famous charm, wrapping her arms around you when you arrive. And another little piece of your heart still stays behind when you depart, reminding you to come back soon," she said. "Captain Phillips' vision for her return to the rivers is one we all share, and the Delta Queen Hotel staff is dedicated to preserving her until this happens. The commemorative plaque program is a wonderful way for us to support the legendary one, and a way for us to leave our permanent stamp on her forever." Mrs. Traynor also urged devotees of the Delta Queen to spend time aboard the Delta Queen Hotel. "She is in the best place she can be right now, nestled in a very safe, picturesque landing at Coolidge Park. The success of this venture is crucial until she can cruise again, and I hope that both former passengers and crew will visit her from time-to-time." she said. Leah Ann Ingram, managing partner of the Delta Queen Hotel and co-owner of All Aboard USA, encourages Delta Queen fans to check the website for special packages and group rates, or call the Delta Queen Hotel at (423)468-4500 to make a reservation today. "This program is a meaningful way to recognize all of the past passengers and crew that have sailed on the Delta Queen, as well as offer them the opportunity to support our caretaking efforts to see her sail again," says Ingram. Membership in the Delta Queen Crew Club will offer additional benefits in the months to come, including special "Crew" weekends and packages that are currently being developed. The weather resistant 3x6-inch plaques are available for purchase beginning today for $100. This special offer is limited in number and is only available to past passengers and crew, or may be purchased in memory of a past passenger or crew member. To become a member of the Delta Queen Crew Club and order a plaque for yourself or someone you love this holiday season, call (800)499-9877 between the hours of 10 a.m. and 5 p.m. Monday through Friday, or visit the website at www.deltaqueenhotel.com. More holiday gift ideas on this page:Delta Queen holiday cards * Delta Queen coin *Delta Queen calendar *Steamboat preservation calendar. The Dave Thomson Collection - This areahad water damage and had to be completely renovated (not really, websitesare not vulnerable to water damage). Instead of a linear string of files,the two hundred items are grouped by category: illustrations, photos,and specific subjects. The pages are large, but we are making thesechanges since most people are on broadband nowadays. If you are still ona slow connection, click the link, then go do some yard work and come back.The photos may take a long time to download. Jim Hale's City of Monroe - This exhibitshows master boat model builder Jim Hale's masterpiece, The City of Monroe,a radio controlled scale model. The exhibit includes an article from theNautical Research Journal, December 1975, Vol. 21, No. 4, plus photos of thisamazing model. Also in this exhibit, photos of Jim Hale and the late JohnHartford piloting the Julia Belle Swain. Also, photos of John Hartfordby my father, Bill Muster. Mississippi Queen - A newlyremodeled exhibit of historic Mississippi Queen photos, and a recent phototaken by my brother, Bill Muster, March 2009. Guadalajara! -Photos of the 2009 convention of the Society of American Travel Writers. 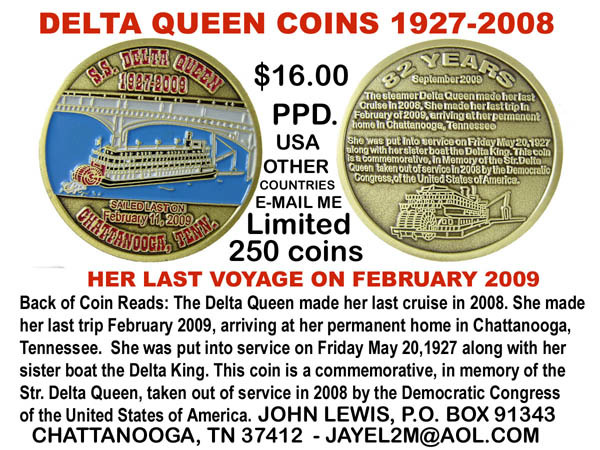 TheSATW has been a huge supporter of the Delta Queen since Betty Blake became amember in the 1960s. King of the Mississippi - New photosfrom Ronald Simmons of his award-winning model, which is for sale. Belle of Louisville -Photos by Roger Hilligoss showing damage to the sternwheel after a collisionwith a barge in October. Visiting this site has left my glasses all misted up and all my envelopes selfsealed!Not to mention that I'm half deaf from either that whistle or the Calliope! Editor's Note: Thanks Dave, good to hear from you, sounds like it hit the spot. message: The photo question asking the location in the photo of the steamer "Metaline" was taken in Box Canyon. It is heading south. The negative has not been switched. Editor's note: This is more kindling on the raging controversy that this photo ignited,see: mystery boat page. I willalert John, Dave, Peggy, Deborah, and Andrew. We had fun discussing this last year. Steamboats.com has documented the Belle of Louisville accident October 17,click here to see photos. 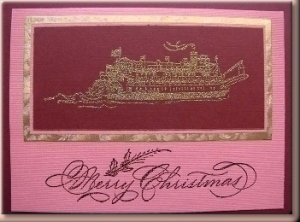 Click the card for more information about these beautiful Delta Queen holiday cards by Karen "Toots" Malloy.Fill your holiday giving with steamboats, here at Steamboats.com. Scroll down for 2010 calendars - one from the HSPS showing a variety ofhistoric steambats and one dedicated jsut to the Delta Queen. Looking for that unique and practicalholiday gift, or a great collectible? The HSPS 2010 Calendar is Available Now! 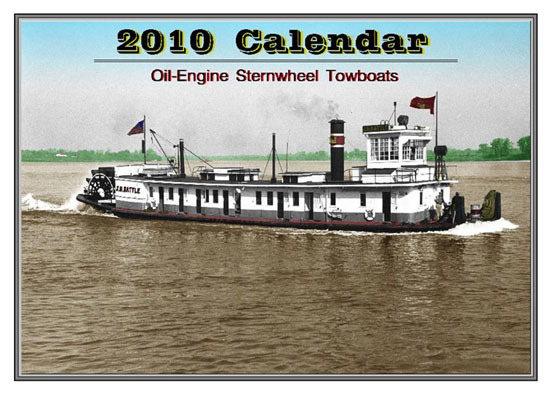 HSPS, Inc (a 501.c.3 non-profit) publishes a Riverboat WallCalendar each year, with proceeds going toward maintenanceof the 1923 sternwheel towboat BARBARA H. Our 2010 calendarfeatures early photos of sternwheel towboats. The calendarcontains 13 large photos printed on heavy card stock, suitablefor framing. 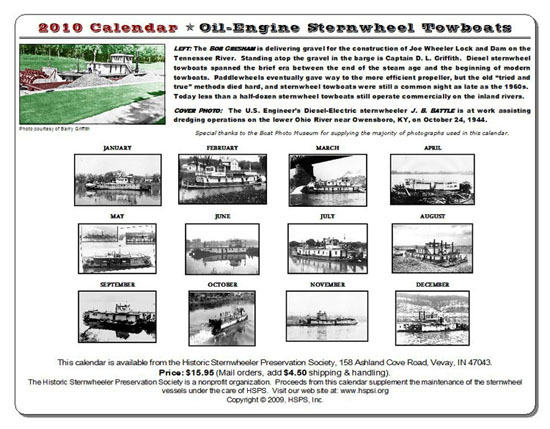 This is the Historic Sternwheeler Preservation Society's ninthcalendar, with all proceeds going toward the maintenance ofthe BARBARA H - the nation's oldest operational sternwheeltowboat, and a National Historic Landmark. Shipping: $4.50 for one; (add $1 for each additional calendar). Click here to see the 2010 Delta Queen wall calendar. DON'T begin on the righteous note of "As a citizen and taxpayer. . ." Your elected representatives assume you are a citizen, theyknow we all pay taxes. DON'T apologize for taking his or her time. If you are brief and tothe point, he or she is glad to hear from you. DON'T say "I hope this gets by your secretary." This onlyirritates the staff. DON'T be rude or threatening. It will get you nowhere. DON'T be vague. Some letters received in congressional offices arecouched in such general terms that it leaves the senator or representativewondering what the writer had in mind. Editor's Note: A good clear message would be to write about what the DeltaQueen means to you, what it means to our country, and the local economies.Explain that you want to see it traveling the rivers once again.This could happen any number of ways, so avoid focusingon a particular bill or politician. The actual possibility of returning ourperfectly safe and functional last remaining historic overnight passengerboat to the rivers in 2020 is simply a brilliant thought. It is still 2009so nothing about how this will happen is known to us yet. Hey, maybe thataffirmation is working. 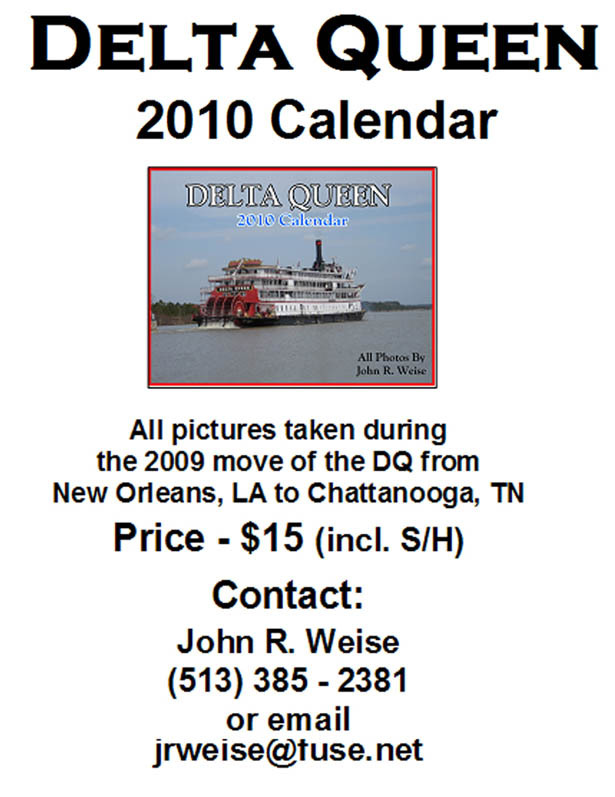 * Also, remember to pickup a 2010 Delta Queen calendar while they are readily available. Editor's Note: this situation is on hold right now, but let us shower ourlegislators with little love notes about our boat. (Washington, DC) - Congressman Baron Hill has introduced an amendment to the Coast Guard Authorization Act of 2010, H.R. 3619, regarding the necessary exemption for the Delta Queen to resume cruising. In order for the amendment to reach the floor of the U.S. House of Representatives during consideration of the larger bill, H.R. 3619, the House Rules Committee must first find the amendment germane and in order. The amendment language offered by Hill would specifically restore the exemption from the fire-retardant materials construction requirement for marine vessels operating within the Boundary Line through November 1, 2018. Completed in 1927, the Delta Queen has a superstructure primarily of wood and can carry more than 170 passengers. The 1966 Safety of Life at Sea Law prohibits any wooden vessel carrying more than 50 overnight passengers from operating out of a United States port. However, Congress has provided the exemption for the Delta Queen eight times since 1968, primarily because it was intended for seagoing vessels and not riverboats. The exemption was rejected last year in the form of a motion to recommit during the consideration of the Coast Guard Authorization Act of 2009. Hill supported the motion, but it failed by a narrow vote margin of 208-195. "My perspective on the Delta Queen and its safety has evolved significantly," Hill said. "After speaking with various officials and the former captain of the Delta Queen, I am convinced it should cruise again. To that end, I have introduced this amendment with the full intent of seeing this through until the Delta Queen is back on the Ohio River. The Delta Queen is not only historically significant, but is a job creator and economic boon to the areas along its route." "We envision the Delta Queen, wheel turning, traversing the rivers." Good News! There will be a 2010 Delta Queen calendar!This wonderful calendar produced by John Weise sells out every year.Get your calendar now and have a whole year of beautiful Delta Queen photos in 2010.Email John Weise - click here. Sept. 21, 2009 breaking newsclick here for the latest newson the sidewheel steamboat the President. August 30, 2009 - A few days ago I had a server emergency and had to move allmy websites to a new server. Therefore Steamboats.com, Surrealist.org, and a fewothers were off line for a few hours on Thursday afternoon, then fully up and runningagain as usual by Saturday morning. Life throws you a few curve balls, and this wasdefinitely one of them. I apologize for any inconvenience this may have caused. If youfind any broken links or missing jpgs, please contact me. To Everyone Who Cares About The Delta Queen: I have shared correspondencewith Harry Phillips, who is Project Manager and part of the group who hasleased the Delta Queen and is currently operating her as The Delta QueenHotel in Chattanooga, TN. I believe Harry truly cares about maintaining theboat to the highest of standards. We all hope that she will get herwell-deserved exemption. However, in the meantime, I'm sure she is happythat she is being "well-polished" and loved.